The Ministry of Trade, Industry and Energy said Friday that it would urge the nation’s nuclear power plant operator to shut down its oldest nuclear reactor ― the 587-megawatt Kori-1 reactor in Busan. The Energy Ministry plans to deliver an official request to the state-run nuclear operator Korea Hydro and Nuclear Power not to extend the reactor’s lifespan beyond its scheduled expiration date on June 18, 2017, effectively shutting down the plant. The decision was reached at the ministry-led 12th National Energy Committee meeting held Friday in Seoul, attended by government officials, energy experts and civilian organizations. It also comes as the government announced plans Monday to build two more nuclear reactors by 2029. 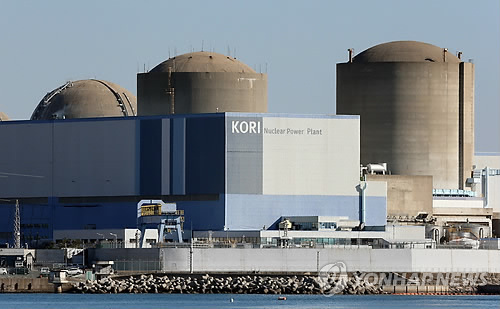 Kori-1 is scheduled to become the first reactor to go dormant since it began running 37 years ago as the first nuclear power plant in Korea, bringing the total number of active nuclear power plants in the country down to 22, once operations stop. After the reactor’s scheduled 30-year lifespan expired in 2007, KHNP gained approval from the Nuclear Safety and Security Commission, the nation’s nuclear watchdog, to continue its operations for 10 years until 2017. Though KHNP must file a new extension request to the NSSC by next Thursday in order to keep the Kori-1 reactor running for another decade, the nuclear operator will likely refrain from doing so, in line with the government’s request. As the extension deadline has neared, the KHNP continued to call for the continued operations of the country’s oldest nuclear power plant, asserting that the plant remains fundamentally safe and economically viable. However, Busan authorities as well as civic environmental organizations and citizens living near the reactor site had been strongly pushing for the aging reactor’s shutdown, citing serious safety concerns. “The Kori-1 reactor has already been in use for 40 years. Adding 10 more years will inevitably add more risks and dangers. The reactor has had 130 breakdowns and accidents, the most out of any nuclear reactor in the country,” said a group of Ulsan lawmakers in a collective statement Friday. The shutdown process ― which includes determining how to dispose of the stored nuclear waste ― is estimated to take around seven to 10 years to complete, according to KHNP. Given that the Kori-1 reactor’s total energy output is less than one percent of Korea’s total electricity production, the upcoming shutdown is unlikely to drastically impact the nation’s current electricity supply, according to industry watchers. Meanwhile, there are five more aging nuclear reactors ― including the Kori-2 reactor ― which are set to reach the end of their scheduled lifespans by the year 2025.